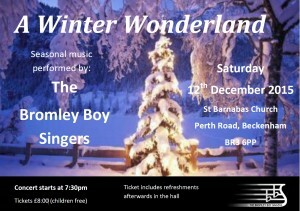 On Saturday 12 December at 7.30pm, St Barnabas welcomes the Bromley Boy Singers for A Winter Wonderland, as they perform seasonal music. The concert is followed by refreshments in St Barnabas Hall. Tickets are £8 for adults, children free.